Discussion in 'News' started by AndrewRed, 22 January 2017. In VintagePvP, you don't work with Levels and Scores like in KitPvP, it's all about the kills, deaths and your KDR. For every kill you make, you will receive a Coin. You can use these in the Kit Shop to buy Items and Armor, because every offered kit is free to use for everyone! We did add some donator perks, but the most important one is that VIP+ and higher is able to enter 2 Donator Areas in the Pub. Almost everything else is just like used to, including the 1.8 PvP combat; because what is a vintage version of an older KitPvP without the older style of fighting? When will this gamemode come online?! We are currently working on the minor details to make this gamemode as perfect as possible when releasing, and that's why we decided that this gamemode will be released on Saturday the 28th of January at around 2 PM (14:00 hours) Dutch time (that is GMT+1)! As soon as this gamemode is online, we will post a new post about this. Andrew & the Staff team. Cool and i like it but can't you make it 1.9 combat system? If you want 1.9 combat please go to the normal kitpvp in the server. When I saw the ģ I was like: Yay! They are adding the very old kitpvp with the castle, the witch hut, the big land and lake. But I was wrong xd it's the kitpvp who came after. I liked it even if I didn't played a lot on it (less then the very old one where I played like 40hours on it). I'm happy because it's the place where I could fond hackers since the update! Hawt, man that looks so cool. Was the original map file found? do you have the oldest backup of kitpvp xd? Lol nice. No hard feelings about the past lad. Hope to check out when im unbanned tho. get off my lawn Bois. I was wondering, original pub areas aren't vip-ish, are they? Looking at that pic preview, my work that i used to do is nothing, impossible, and wotever, just git this gud here. Only real OG's would know: "wekuswe"
From other servers i heard some hollandcraft players say Michel is only keeping the server online to make some last money from players to buy stuff he isnt going to worry anymore he will just keep server online intill 0 players online everyday and shut it down he is just getting his last money ---- I hope this is not true make the server great again please! I was one of those people who gave warnings. Sometimes no one listens, but all hollandcraft did was try to stay fresh and not outdated, even tho that is what most players wanted. If you are trying to make someone look bad, at least take the time to look up if you don't have any false information or opinions. Oh, and try fixing your grammar and vocab sometimes, you have 12 grammar mistakes at a first glance, try finding all of them! Also, if you want to make Michel or the server look bad, don't start an argument with ''Michel is only keeping the server online to make some last money from players'' and then end the conversation with ''I hope this is not true make the server great again, please!''. That is quite conflicting with your own opinion. Your daily reminder of your English teacher. It's simple, we just waited too long to update everything, and when we updated we updated to the new combat system, in those 1000 players online there were about 750 in the Skywars servers, on those servers, which costs huge amounts to host to give the players a lag free experience, there was nearly nobody who have bought a rank. This is why we stopped giving attention to this server, and possibly every server, back than I was the only one to maintain everything, and i lacked doing that. Really? Last 9 months or so there was a loss of money of about 300/400 euro's a month, please don't say stuff like this, it makes no sense. Of course there were days we made some money with the server, but if I spend it all back then, there wouldn't be enough money to keep the server online for the past few months. Also I know there were servers with 800/900 players online at the same time as Hollandcraft did and they made 4 or 5 times as much. At last I know a guy who already started 2 servers, made some money from it, stopped and is now working on another one, so please, don't say things like this. I'm trying my best, and until the last cent I will do my best to keep the server online. I hope this is not true make the server great again please! As I said, back then I was the only one to update the servers. Since the 'Hollandcraft Next' thing we are working with 3/4 people on the servers to provide a as good as possible playing experience. Of course are we working to try get some of it back, and probably be better as back then. Also, back in the day with 500+ players online, our network and server management was horrible, if we had the network and skills we have now, back then there would probably be many more players online. At last, nothing lasts forever, but if you fight, you can get it to last longer. 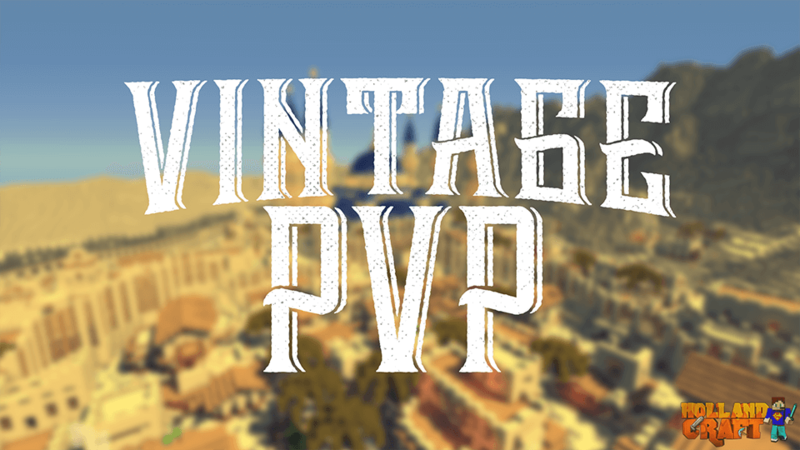 Have you seen vintage pvp? lel its getting filled too much.